If have been asked time and time again can the disc heal well below I found a great explanation from a colleague in San Fransisco. It only makes sense that herniated discs would be able to heal...after all, the disc material is living tissue. But the thing is...the conditions need to be right (some discs are beyond repair)...and so does the treatment. 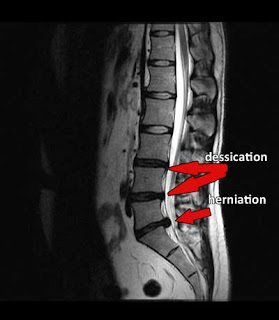 Most cervical or lumbar disc herniations have been present long before they are detected. During this time a lot of damage can be done to the spinal disc and surrounding structures. The spinal discs stay healthy when the bones they attach to are able to move through their normal ranges of motion. When the bones lose their normal position...say from spills and falls when we are a child...or from sports, or just poor posture over time...the spinal disc are unable to exchange nutrients with the blood stream. So, they weaken and breakdown...setting the stage for a cervical or lumbar disc herniation. All of this happens gradually. Of course a disc can rupture from a trauma, such as an auto accident or falling off a horse...but this is less common. What actually happens, is the center of the disc...the "nucleus pulposus", pushes through the outer containment walls of the spinal disc...the "annulus fibrosis"...and puts pressure on the spinal cord or spinal nerves. This can cause sciatica, arm/hand pain, numbness/tingling in the arms or legs, weakness of grip or foot drop, and of course pain the the neck, or pain in the low back. The symptoms can often times be crippling. SO...HOW CAN A HERNIATED DISC BE REPAIRED? Well...sometimes herniated discs will spontaneously heal. Other times, chiropractic care can promote the healing process with a herniated lumbar or cervical disc complex. But what if nothing helps...than what do I do? This is when we should consider non-surgical spinal decompression with the DRX9000 (lumbar decompression) or DRX9000c (cervical decompression). The DRX9000 was specifically designed and built to treat lumbar and cervical disc bulges and herniations. So...this is most logical "next step" if chiropractic does not help...at least at my manhattan clinic it is. And...the results are great. Sure...decompression therapy does not help everyone...but nothing does. And...it is very safe. There has never been a single case of the DRX9000 herniated disc repair system causing permanent bodily harm...at least to my knowledge. IT'S WORTH A SHOT. 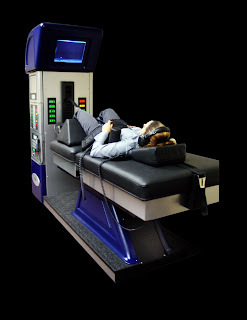 In my Manhattan practice I specialize in Non Surgical spinal decompression using the DRX 9000. A recent study shows that 89% of patients responded favorably to treatments without relapses.